Did you know Doctor’s Day is on March 30th? Memorable Gifts wants to know how you say thank you to your doctors! 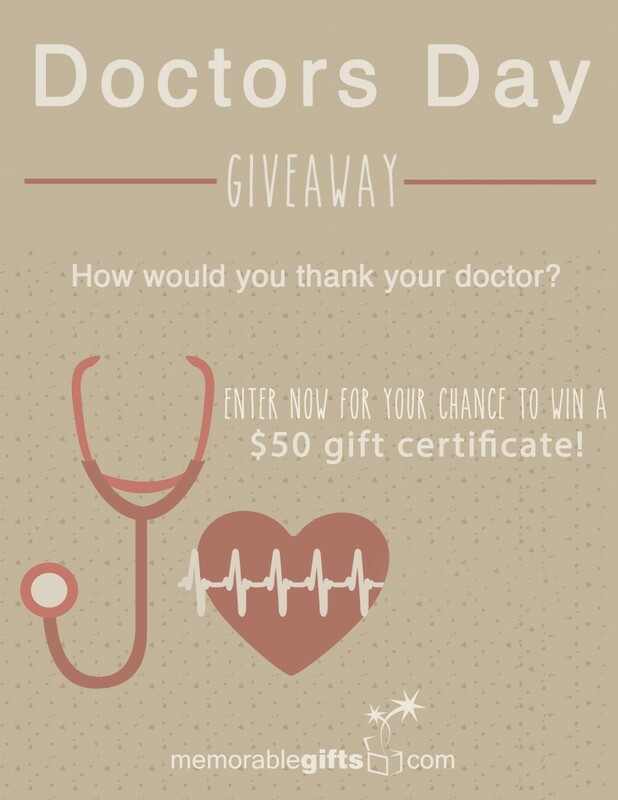 Leave us a comment and tell us how you would thank the medical professionals in your life for your chance to win a $50 gift certificate to memorablegifts.com. Don’t forget to check out our blog for Doctor’s Day gift ideas, thank you notes, and more! The contest ends on March 30th. Good luck! I would thank my doctor with a $50 gift certificate from memorable gifts! I would give him something from your Office Gifts and Desk Accessories. I am sure to thank him for his time and consideration and once gave him a starbucks giftcard. I would give her a chocolate basket. I would send flowers to her office with a nice card telling her what a great doctor she is. Thank my doctor in my Christmas card sent to them! My sister-in-law is a doctor so I would buy her a spa treatment! i would personally like to slap him in the face he is useless and hands me tablets outlike sweeties and never wants to investigate any of my problems that is why i am now almost wheelchair bound. I would get my doctor a gift certificate for a dinner for two because he and his wife are expecting their first child in a month. After that, they won’t have much time.for dinners out! Flowers and a card. If he did not have time to enjoy them maybe the medical receptionists and patients can enjoy them in the office for the day and his wife in the evening. I would like to thank my doctor by giving him a nice new picture frame as he has some lovely pictures and photos in his room. I’d just say thank you. I would just say ‘thank you’ as I don’t think it is ethical to give gifts to the doctor. I’d just say thanks too. I’d treat him to a meal at his favourite Italian because he’s absolutely brilliant! And a very professional yet approachable man. I only go around once every 2 years and it’s a different doctor every time so a card would do.